Information-security startup poised for growth with global brand recognition and allegiance. Revolutionary end-to-end email encryption—transparent and automatic to users—that brings customers the most secure, federated email solution available on the market. Lavabit’s lowest encryption setting is the highest setting offered by competitors. Technology is the first email standard to minimize the leakage of metadata and provides powerful new tools to prevent phishing, eliminate spoofing, and fight spam, malware insertion, and other email-borne attacks against consumers and corporations. According to Gartner, the global cyber security market is currently worth around $131 billion and is set to increase by 88% by 2025. The global email encryption market valued at $3.92 billion in 2017 is anticipated to grow at a healthy rate of more than 27.8% through 2025 to a market value of $27.9 billion. More than 100,000 returning customers and 15,000 new customers in over 85 countries since the relaunch. Currently profitable with over $150,000 in recurring annual revenue with the potential to be a $1B company in 10 years. Freedom fighters who have never stopped fighting for you. Lavabit was founded on the principle that everyone—individuals, organizations and businesses—have an innate right to private, secure communication. We’ve never wavered from that mission. In 2014, the company suspended its service to protect global customers after the US government ordered Lavabit to release its Secure Sockets Layer (SSL) private keys in the wake of the Edward Snowden data release. Citing its philosophy of digital rights, privacy and customer protection the company suspended operations. The Company went underground and rebuilt email the way it should be—from the ground-up and secure from point A to point B—so this could never happen again. A pioneer in email security with over 15 years in-the-trenches experience, we have intimate knowledge of email standards and encryption technologies, which has kept our technology years ahead of the curve. Trusted, proven and privacy battle-tested, Lavabit is not your typical start-up. Coming out of stealth-mode, Lavabit is back with the Dark Internet Mail Environment—DIME—a revolutionary new end-to-end encrypted global standard that powers Flow, our new email subscription service, Magma, our encrypted mail server, Volcano our forthcoming email client, and other DIME enabled technologies. 269 billion times a day, users sacrifice privacy and security when they hit send. More than 74 trillion messages are transmitted a year by 3.7 billion email users. Virtually every aspect of global communication, commerce and life are mediated by email. Email is at the core of our cyber identities—a role that’s increasingly risky. Like a postcard in the mail, emails expose their data and metadata as they travel—giving attackers easy access to personal information, systems and networks. As defined by true end-to-end encryption, email security is a complex and elusive problem that no one has solved until now. When the first email protocols were developed in the 1970s, security and privacy were afterthoughts, and encryption technologies were restricted. While ad hoc efforts have attempted to bolt security functionality onto legacy SMTP, POP3 and IMAP protocols, they’ve fallen short—both in effectiveness and ease of use. The handful of new solutions touted by startups have proven cumbersome and ineffective in delivering automated, cross-platform protection. Lavabit is bold. With our flexible architecture, we are replacing legacy email with a new federated, end-to-end encrypted protocol that’s user-friendly, accessible and effective. Our Dark Internet Mail Environment and associated encryption technologies are simple enough for your grandmother to use but secure enough for nation-state secrets. Leveraging lessons from the 28-year history of Pretty Good Privacy (PGP), Lavabit has created the Dark Internet Mail Environment—DIME—the world's first end-to-end encrypted “Email 3.0” global standard. Lavabit’s encryption methodology and server technology solve the problems of centralized trust authorities, cross-domain and cross-platform interoperability, and is the first email encryption standard designed to minimize metadata leakage. Problems that cloud-mediated, and other “walled-garden” email security approaches fail to address. Simply put, there is more than just encrypting a message in transit. Email adds a new complexity to secure communications. Instead of having a secure single channel between the sender and a server, like when you’re browsing the web, it’s also critical to have a secure channel between users, so that messages remain protected from sender’s computer, all the way to the recipient, regardless of how many servers, or service providers the message must pass through along the way. DIME does just that, by delivering layers of encrypted protection in every step of this process. Inherently, email clients running Lavabit technology can communicate securely within their domain and with any other DIME capable client. By incorporating encryption directly into protocols and at user-end-points, we created DIME to be the critical and until now missing piece of the cybersecurity puzzle. A critical first step in preventing corporate espionage, safeguarding consumer cyberattacks, eliminating phishing, spoofing, spam, TLS stripping and drive-by malware insertion attacks. Because it’s infinitely extensible, the DIME standard can easily be adapted to provide protection for encrypted voice calls, online chats, cloud-based file storage, enterprise workflows, and blockchain applications. Any encryption technology that can be linked to an email address, can benefit from DIME. It will be a revolutionary unified encrypted ecosystem capable of restoring privacy, ensuring control over the security of our data. Encryption provides the mechanism, while DIME provides the means. DIME minimizes metadata leakage, automates message encryption and resists manipulation by an attacker. Lavabit powers true end-to-end, multilayered encryption between users. The message is encrypted and digitally signed before it leaves a sender’s device. The message's various metadata components are also encrypted, which minimizes leakage, as it travels the internet. The complexity of user key management can become invisible to the user. All they need is software which implements our new security protocols. By performing message encryption at the user level—within the client email application—DIME eliminates the exposure of critical cryptographic functions to systems outside of user's control. When a message passes through the server fully encrypted, its contents and metadata are shielded—providing critical protection to a world where email increasingly being stored on centralized servers. To minimize what a potentially compromised server can access, we made DIME messages analogous to sealed shipping containers. All a hostile server can see is the next hop on the path for a message. It’s the most common form of business communication—accounting for more than 70 percent of total message volume. Email is the central nervous system for modern companies. Which is why email is one of the first things targeted by attackers. Many of the most famous security breaches can be traced back to either an account or an email server being breached. Whether it’s phishing, email-borne viruses, or inserting malware into an unencrypted attachment from someone the victim already knows, email is a critically vulnerable form of communication. And in the wake of high-profile security breaches at Yahoo, Facebook, Marriott, Equifax and dozens of other organizations, consumers and businesses are waking up to the need for secure email, and the need to pay for encrypted protection. Although the United States is adopting email encryption at a faster pace, China, Russia, Japan, Korea, and India are all expected to increase their respective markets during the next five years. Awareness and investment in email encryption technology is a growing global trend. According to Gartner, revenues from the rapidly growing global email encryption market will grow to nearly $27.9 billion by 2025. Integrated security solutions. Existing security solutions remain problematic from an integration perspective. As network infrastructure becomes increasingly complex, vendors need to offer more robust encryption solutions that are automated, transparent and compatible to stay relevant among end users. Business adoption and expansion. Email encryption is moving beyond the large corporate enterprise market. Shifting requirements and regulations have forced small and medium-sized businesses to innovate and refocus their business models and infrastructure to adopt email encryption. Lavabit’s B2B focus is on industries with regulatory requirements to safeguard information and industries regularly targeted for information theft. Specific sectors include insurance, financial services, banking, health care, law firms, biotechnology, political figures, and journalists. Any business with valuable intellectual property, large amounts of consumer data, or that view confidentiality as being business critical are prime targets for adopting email encryption at an organization level. Cybersecurity Ventures predicts that overall cybercrime damages will cost the world $6 trillion annually, up from $3 trillion in 2015. Clearly, cybercriminal activity threatens all aspects of our ever-increasing digital lives and will be one of the biggest challenges that humanity will face in our evolving technology-dependent world. Consequently, global spending on cybersecurity products and services will exceed $1 trillion cumulatively over the next five years, from 2017 to 2021. The extensibility of DIME means Lavabit will be well positioned to grow beyond email and benefit from this rapidly growing market segment. DIME’s technology and timing are poised to revolutionize email security. Lavabit’s DIME technology is the only peer-reviewed, federated solution capable of providing automatic end-to-end encryption for email. DIME’s unique encryption methodology ensures secure and reliable delivery of email while providing confidentiality, preventing manipulation and eliminating metadata leakage along the delivery path. Backed by over 6 million lines of source code, Lavabit’s breakthrough technology automatically and securely ties an email address to a public key. Our platform makes it possible for software to securely perform encryption functions automatically, and without burdening the user. This makes the Lavabit solution more versatile, secure and flexible than any technology available today. Consumer and business customers are already using the Lavabit email service with a Flow email subscription. 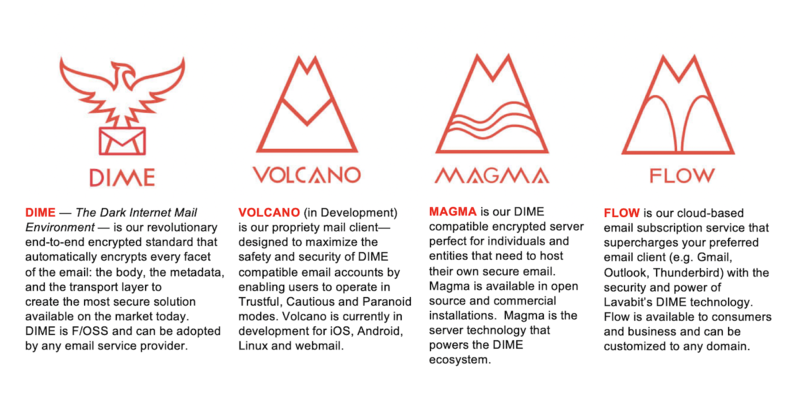 With the introduction of Magma, Lavabit’s DIME-compatible server, our technology is already gaining traction in the marketplace. 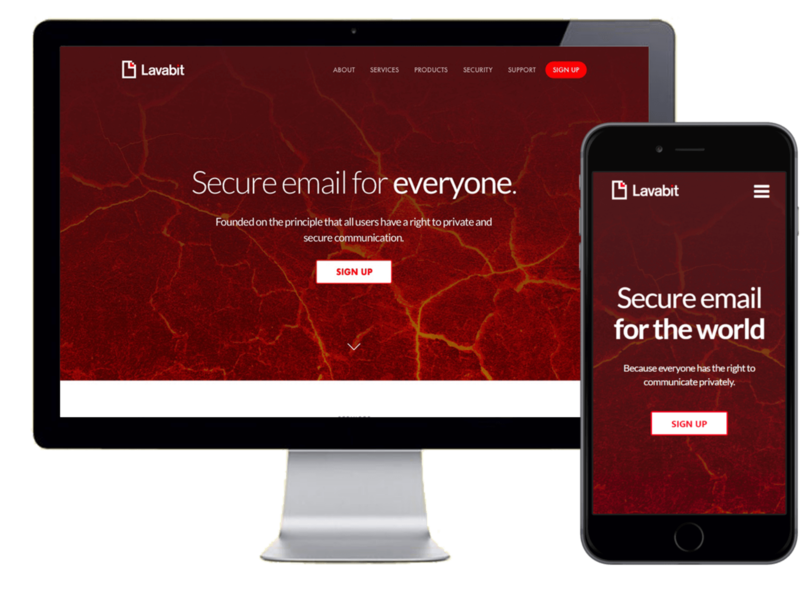 With Volcano, our still-in-development email client for Android, iOS, and the desktop, Lavabit is poised to turn email into the secure communications platform our personal and corporate users want, and the market demands. Because the world is mobile, we're building Volcano. The reality is that the world is mobile, and thus, we must get the technology directly into the hands of its users. 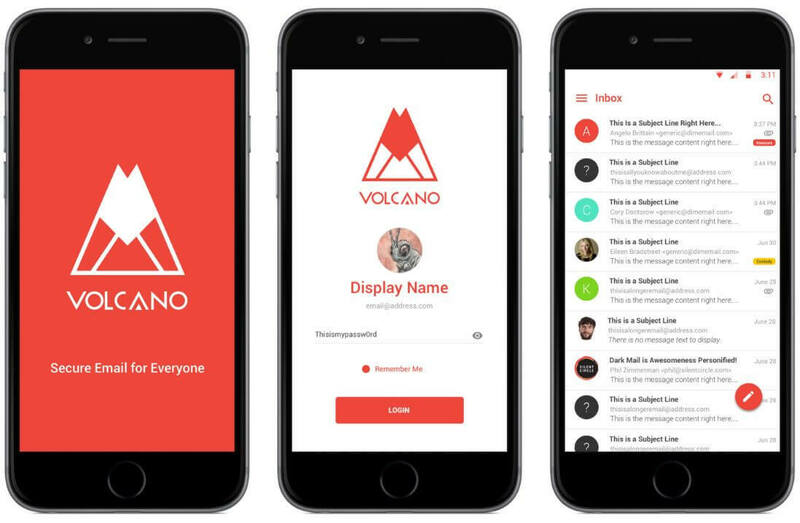 The primary use of campaign proceeds will the completion of Volcano, which is presently slated for launch in 2019. Lavabit’s DIME-compatible mail client will enable users to operate in our vaunted Cautious and Paranoid modes. As such, the development of Volcano for mobile devices is the Company ’s top development priority. 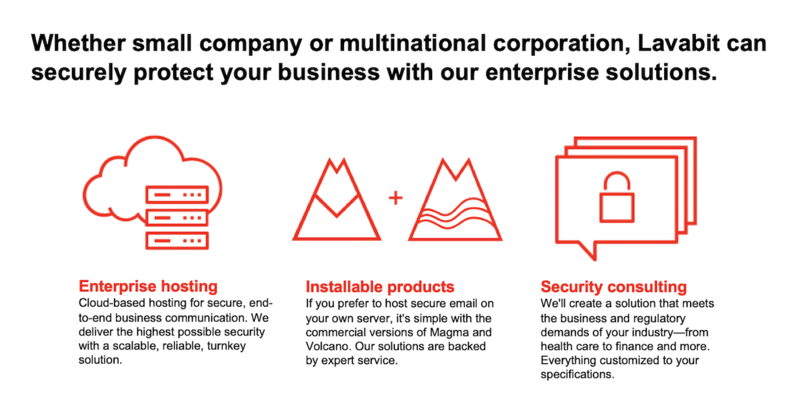 Both Magma and Volcano interoperate with legacy email systems and will be made available to customers as a: cloud hosted service, user supported installable products, or hybrid, where customer installations are managed by the Lavabit professional services team. Clearly, Lavabit email provides the ideal solution for consumers seeking complete email privacy, companies operating in sectors where keeping email messages confidential is critical to business success, and companies who need to adopt the use of email encryption software for regulatory and data-security compliance. Since our relaunch, we have learned that based on our principled customer stance, Lavabit has retained its reputation as one of the most trusted email encryption brands. 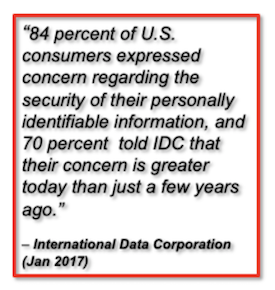 Lavabit will use its market perception and security-first focus to enshrine the DIME encryption standard within the consumer and enterprise segments of the rapidly growing global market for cybersecurity. As such, Lavabit has developed a phased go-to-market plan predicated on the development of our email client and the ability to scale our product and service offerings to create a broader encrypted ecosystem. To stimulate early adoption, Lavabit is advancing an open source strategy, in an effort to distribute DIME technology and demonstrate consumer and commercial viability. 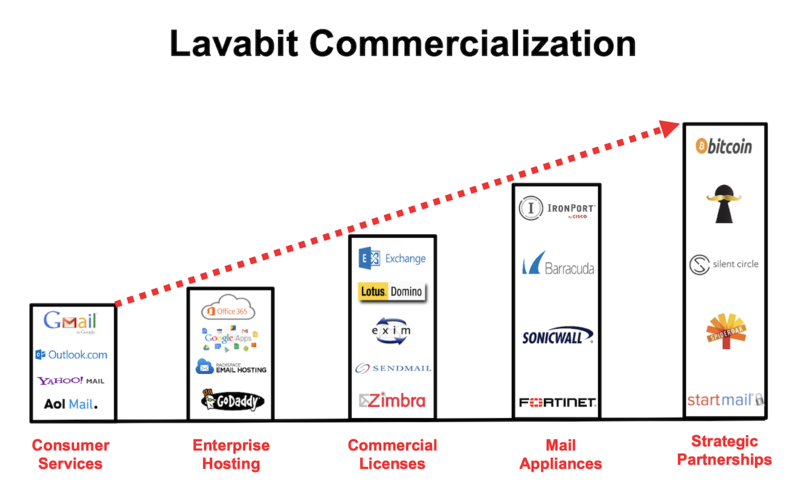 Lavabit’s business strategy starts with a B2C and B2B cloud hosted email services, with an eye towards expansion into the on-premise market through direct, and value-added reseller (VAR) sales. Future SaaS, licensing, and consulting revenues will be key profit centers as Lavabit expands its commercial footprint. Central to Lavabit’s focus is to position DIME, and DIME compatible technologies, as the superior alternative, and natural successor to existing enterprise email platforms like Microsoft Exchange, Lotus Domino, Oracle Messaging Server, and Zimbra. 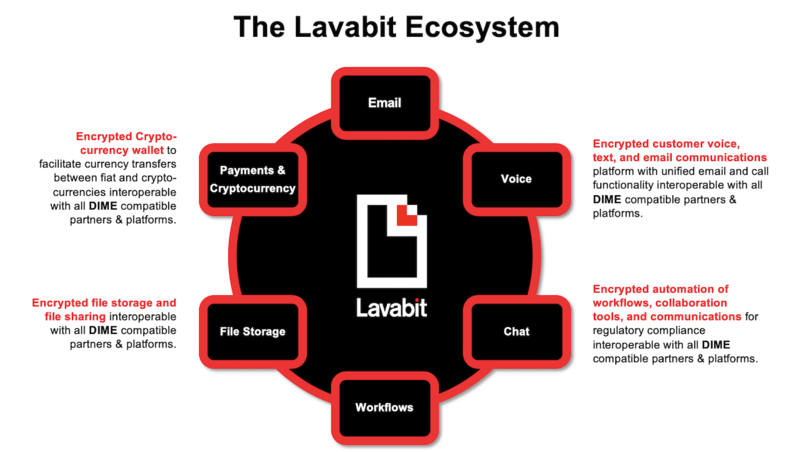 Lavabit’s vision is to become the provider of choice for consumer and commercial users looking to the cloud for both outsourced, and installable email solutions. Phase 1. Consumer cloud. Consumer-focused encrypted email services. Pricing is based on a subscription upsell model determined by storage capacity. Phase 2. Business cloud. Geared toward small and medium-sized businesses with limited internal capabilities looking for hosted email solutions. Pricing is based on channel volume and account size. Phase 3. Commercially licensed installable products. A feature-rich, easily managed, highly secure email solution for customers with sophisticated IT departments or a need to host data on their own infrastructure. Channel partners and value-added resellers will develop, deploy and support versions of the installable products. Through partner collaboration and direct professional service engagements, we plan to promote the customization of Magma and anticipate this will result in vertical-specific features being developed. Phase 4. Commercially purchased appliances. Government agencies, military contractors, political activists, and high-net-worth individuals are just a few examples of customers that will require the immutable protection of hardware-level security. These turnkey solutions will offer superior protection and simplified management for the market segment seeking fire-and-forget email servers, and access devices certified to handle the most sensitive private and public sector secrets. Lavabit is profitable with ongoing B2C subscription revenues. 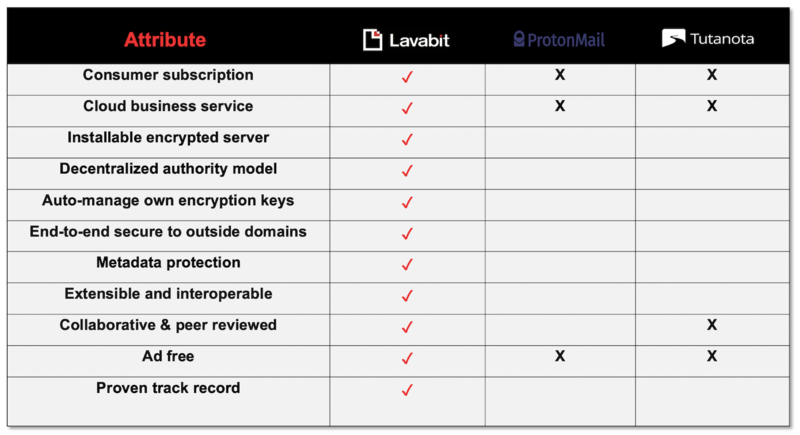 Lavabit currently sells encrypted email services to consumers, and small businesses using a subscription model. Lavabit’s subscription revenues are generated through the sale of its standard service plan, priced at $30 per annum, and its premier service plan, priced at $60 per annum. *Some customers are subscribed to our standard and premier service plans but receive discounted pricing because of a promotion that was offered during Q1 and Q2 of 2017. Lavabit’s existing B2B revenue is derived from providing a hosted email service to small businesses, priced on a per-user basis, and through the sale of support contracts for its Magma mail server. The pricing for support contracts is variable. We’ve currently sold several per-installation contracts priced between $10,000 and $15,000. With adequate funding, Lavabit will prioritize, and expand its direct sales effort, by switching from a reactive model, to hiring a proactive sales team. We also plan to formally launch a VAR sales program. Based on a conservative bottoms-up projection, Lavabit anticipates continued YOY profitability and robust growth of its B2B sales. Lavabit’s solutions are uniquely suited to balance automated convenience and ironclad protection for security-conscious users. Lavabit email is compatible with any domain that has implemented DIME. Lavabit is the only federated and interoperable email technology capable of offering secure, end-to-end email compatible outside its domain. No other company has solved the walled-garden email security shortfall. Lavabit’s lowest encryption setting—Trustful—is the highest setting offered by competitors. 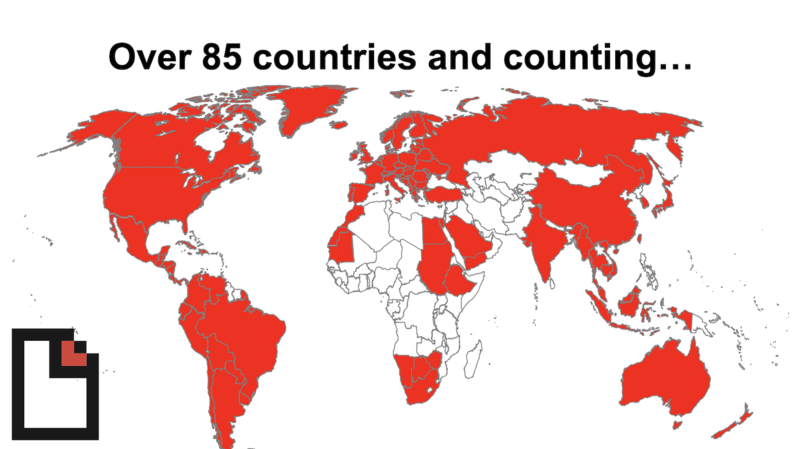 The current user base includes 115,000 customers in more than 85 countries. Before suspending operations in 2014, Lavabit had more than 410,000 customers. Since the relaunch in 2017, Lavabit has migrated 100,000 returning customers, added 15,000 new customers in 85 countries and installed two commercial Magma server beta implementations. With zero marketing efforts, the Company has attracted more than 500,000 unique visitors from 170 countries to lavabit.com. There’s significant media and market anticipation ahead of Lavabit’s broader market entry efforts. More than 300 members of the professional media are waiting for the opportunity to participate in the beta test, and nearly 100,000 customers are ready to sign up for service when DIME is fully operational on compatible email clients. "Long before Edward Snowden became a household name, Lavabit was fighting to keep email safe. The company has always been a guardian of digital freedom and with its DIME- enabled solutions now has a robust technical arsenal to do so. The company needs all of our help to make sure that encrypted email is accessible to all." Check out Habeas Data chapter 6 on Lavabit here. Once the email products and services achieve a steady state, Lavabit will begin reaching out to new markets with its suite of encryption solutions. The goal is to position Lavabit as the single source for securing communications and data. Some growth products and services will require little to no additional development and be available in the near term. Others will require additional development and won’t be pursued until specific milestones of our core business roadmap are achieved. Lavabit’s DIME technology ties an email address to a public key infrastructure (PKI), allowing user-level encryption. From a commercialization perspective, DIME is unique because it also allows for the automated end-to-end encryption of file sharing, telephony, SMS, crypto-currencies, business records, and workflows. The incorporation of encryption directly into the protocols/user-end-points, its interoperable and federated nature, and inherent extensibility makes the Lavabit solution more versatile, more secure, and more usable than any solution available today. Our belief is we can use the DIME email – PKI marriage to create a universal foundation for a new secure identity protocol. DIME is still several years ahead of the curve, but the extensibility of the standard means Lavabit is ready to build an encrypted ecosystem that goes well beyond email. Lavabit is bootstrapping, and the company has maintained its liquidity to continue operations and partially fund development of its Volcano mail clients. Because of its high-margin existing email subscription business, emerging server business and low capital requirements Lavabit can maintain existing profitable operations at current state indefinitely. At this critical development juncture, Lavabit needs growth capital to employ seasoned developers capable of working on a highly complex codebase to complete this Volcano client application and integration phase. As such, the forecasted primary use of the funds will be to finance ongoing product development and day-to-day operations. Mission - We deliver reliable, fast, affordable and secure email service that never sacrifices privacy for profits. Value - We always deliver secure, high-quality email services at the lowest possible price. Service - We provide friendly, competent service to everyone—whether they're customers, new users or interested visitors. Privacy - We vigorously protect the privacy of our users above all else. Usability - Secure email should be as easy as regular email. We develop our services always with simplicity and ease-of-use in mind. Accessibility - We engineer our systems and solutions to accommodate the widest range of users, preferences, and applications. Listening - We engage in ongoing conversation with the community to deliver the features our users want and need. Reciprocity - We stay open source, donate resources to help others and work for the benefit of the community. Engineering - We embrace exceptional engineering that delivers technically superior software and services. Ethics - We strive always to make the right decisions—even if they're not the easiest or most profitable. Since its inception, the Lavabit team has always been a small, all-volunteer group of freedom fighters committed to the principle that everyone has the innate right to private and secure communication. Lavabit relies heavily on contributions from the broader development community and the help of numerous, unnamed, contributors whose dedication, makes the Dark Internet Mail Environment (DIME) possible. 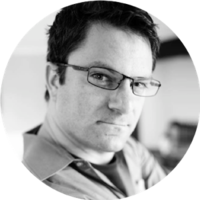 Over the past two years, Lavabit has completed the DIME architecture and specifications with all development efforts led by Ladar Levison. Given the complexity of our code base, global reach, inherent privacy concerns, and unique business applications, Lavabit will seek a highly seasoned executive team bringing Lavabit technologies to market. Leading technology entrepreneur and privacy advocate. A technological warlock, and the team linchpin, he’s currently poised to become a corporate kingpin. A serial deal maker, and former global director at American Express, he’s on the brink of being proclaimed a business guru. 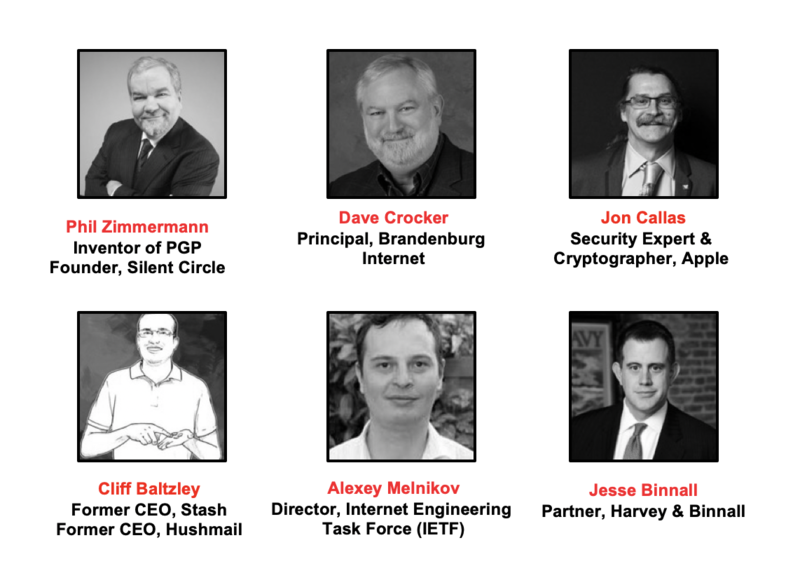 Lavabit has enjoyed the support of many internationally recognized internet freedom fighters and security experts. It would be impossible to list them all. Rather, we’ll only say that DIME was developed in consultation with, and it’s design influenced by, some of the world’s foremost authorities on email standards and encryption. When I started Lavabit, I could not have imagined the journey that lay before me. The more colorful portions of that journey are well documented, and for me, ancient history. What I’m looking forward to our the more interesting story, which is yet to be written. How I managed to take a series of unfortunate circumstances, and use them as a mandate to invent something new, with the Dark Internet Mail Environment, and then grow that invention into a billion dollar business. I believe our revolutionary encryption technologies will do what every entrepreneur hopes for: build shareholder value with a product that has a lasting positive impact on the world we all share. With our relaunch in 2017, we started this journey towards freedom with the first deployment of Magma, our DIME-capable, free and open source mail server. Anyone with a domain can download the Magma bits, and host their own encrypted mail server. But getting the server online is only the beginning. We still have a long way to go before the DIME promise is fully realized. My hope is this crowd raise will provide the resources Lavabit needs to accelerate the process of turning the proof concept implementation we built while in stealth mode, into market disrupting products. Stat process starts with the completion of Volcano. Our graphical email client, and the critical missing piece we need to start providing the privacy protection we all so desperately need. Taken together, Magma and Volcano, will solve security problems neglected by the competition, all while providing a fully federated, completely automatic, ridiculously secure solution to the email privacy problem. There are lots of security charlatans who make the claim they provide user-friendly end-to-end encryption for email. But there is only one Lavabit. The way I see things, Lavabit was 10 years ahead of the competition when it launched a server-centric email encryption platform in 2004. Today the value of a service, which uses encryption to make it impossible for the service operators to access your data is obvious. And since we suspended operations in 2013, a number of companies have come out with platforms that make this promise. But while the competition is focused on protecting users against today’s threats, I moved ahead and developed DIME. And once I believe we are once again ahead of the curve. That’s because buried in the design of DIME, are the tools needed to defeat the threats we’ll be facing very soon. That’s because DIME provides incredible flexibility. It will be implementation and deployment choices that determine whether a DIME user is ready to face Evil: The Next Generation. DIME is ambitious because I want to ensure the people who rely on Lavabit are ready to defeat the future face of evil. The good news is that unlike 2004, the market values innovations in security, and understands the nuanced nature of encryption. I believe that is why so many are waiting for Lavabit to finally deliver a true solution to the email privacy problem. And once we do, it won’t take long for my colleagues in the information security field to see the difference between the marketing hyperbole, and what we provide. Of course, there will be those who don’t see the difference right away, and it will take a high profile security breach, or celebrity whistleblower to make them understand. My guess is the next wake up call will come in about 10 years. And when it does, our customers will once again be happy they chose to trust their data to Lavabit. The smallest investment amount that Lavabit is accepting. Lavabit needs to reach their minimum funding goal before the deadline. If they don’t, all investments will be refunded. If a trigger event for Lavabit occurs, the discount provision gives investors equity shares (or equal value in cash) at a reduced price. Lavabit needs to raise $150K before the deadline. The maximum amount Lavabit is willing to raise is $1.07M. 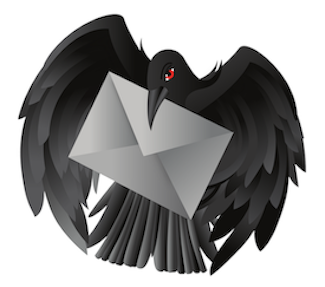 What are the problems with legacy email and how does Lavabit’s DIME solution solve them? Incoming clear text email can be recorded by the provider: Solved. This problem only occurs if the server is configured to accept messages over SMTP for backwards compatibility purposes, and the protection of those messages is implementation dependent. Magma encrypts these messages before saving them to disk, thus making them difficult to view. The provider can undermine the security of the web application: Solution in-scope. This is a development example of why we need funds to build thick clients. We have outlined plans to improve this problem with app development. Still possible to brute force the password verifier: Solved. We wrote our own world-class standard for handling passwords and authentication that makes brute forcing very difficult, even for relatively simple passwords. The provider can observe VPN traffic: Solved. Any provider can follow packets and traffic flows. DIME does allow transparent integration with Tor to prevent this, but it would be up to the provider to offer support. The Facebook app is a good example of this. You can configure Facebook on your phone to connect via Tor. Volcano will detect when a provider offers Tor access, and then could use it to automatically connect, without the user even having to activate it. A compromised device is a sad device: Future Solution. If a device is compromised, then theoretically anything is possible. Our future desire is to eventually offer hardened devices, where keyboard input and encryption keys are protected by the hardware, so even if someone gets malware onto the device, they can't steal keys, passwords, or monitor keystrokes. Mail clients cache data in clear text: Solved by Magma/Volcano. The way the password standard was written, each piece client/server has half the info needed to access the data (in cautious mode). That means if a device is lost, even if the password is known, if the victim changes the password before the attacker can access the data, then they won't be able to log in anymore to get the "shard" needed to access the locally cached data. Passwords are never going to be very good: Solved. We assume passwords are inherently weak, which is why our specification (aka STACIE) requires variable amounts of processing, with the amount dependent upon length making short passwords very expensive to brute force. We believe any moderately decent password in the DIME environment would be out of reach, even for an intelligence agency. Trolling of usernames: Solved. Magma has defenses against that, but they are implementation-dependent. However, the DIME spec does include recommendations to implementers to prevent this. Trust is centralized with current design standards: Solved. DIME is designed to prevent centralized trust. By making a standard and releasing the code, the hope is that people can choose from numerous implementations and pick the one they want to trust... or if they trust nobody, a person can always set up their own mail server. The Walled Garden: Solved. Users need to trust providers like Virrtu, ProtonMail, Signal and so forth to provide valid data. We solve this by creating a federated standard. Users choose the service provider they want to trust, or simply download the code and run a server themselves. Our hope is to make it easy for someone to purchase a domain name, then host their own mail server if they choose. Certificate authorities considered dangerous: Solved. DIME fixes the CA problem. The CA problem is the primary reason S/MIME (the PGP alternative) is flawed. We solve this problem by following the DANE model and embedding key fingerprints in the DNS system, then protected using dnssec. 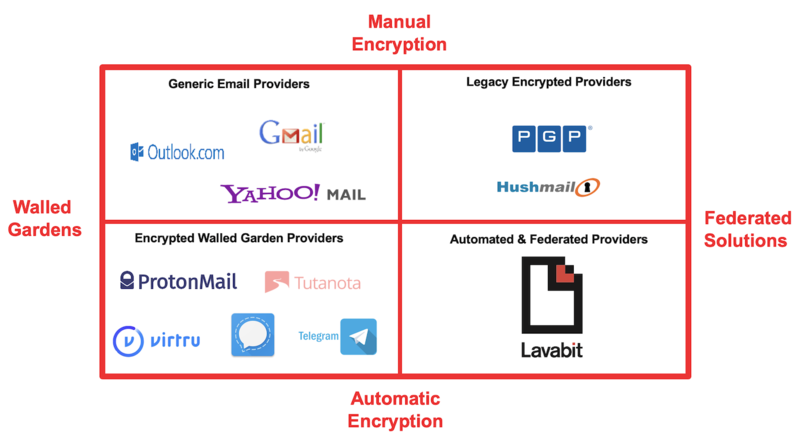 What’s the difference between PrettyGoodPrivacy (PGP) encryption and Lavabit DIME encryption? PGP encrypts messages at the user level, but the encryption process is manual and cumbersome. To manage encryption, a company must dedicate resources to monitor and manage encryption keys—a daunting task that is compounded as the number of users increase. Using PGP, users still have to actively decide to encrypt each message and may send sensitive information unencrypted at any point. Even with the current encryption processes, there are still vulnerabilities to email and user manipulation due to the number of variables that are available through the visibility of metadata; these variables make it easier for attackers or state-sponsored agents to acquire the necessary keys to manipulate the message. 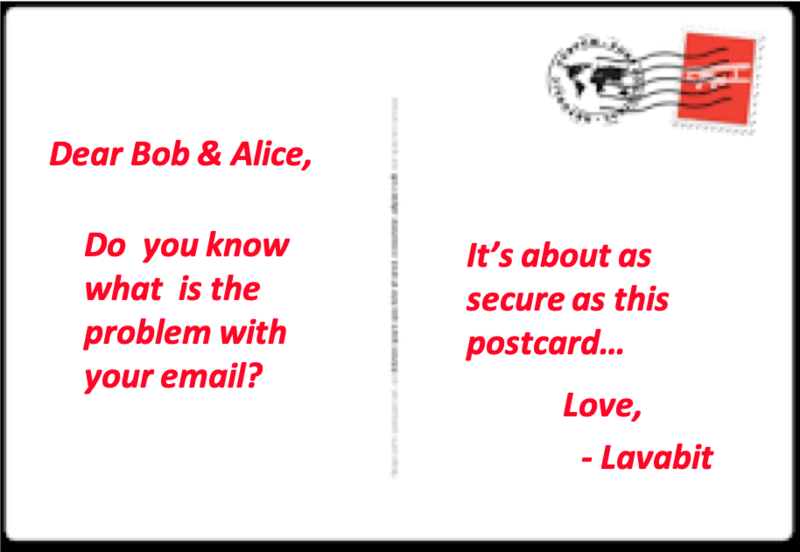 Lavabit’s DIME software is built on the PGP foundation as well but improves on this security by implementing capabilities to provide automatic email encryption and key management—both burdensome in current implementations. Because the process is automatic and universal, there’s no need for hands-on management or user decisions about which messages to encrypt and when. The DIME encryption process also protects metadata and minimizes information leakage as messages are transmitted from system to system. Due to the complexity of cryptographic encryption and the restricted number of variables provided, DIME’s security protocol is extremely difficult to manipulate. This structure makes it nearly impossible for a person to acquire keys or break the encryption algorithm. Where can I find the Lavabit’s DIME specifications and technical documentation? What is the Dark Internet Mail Environment (DIME)? 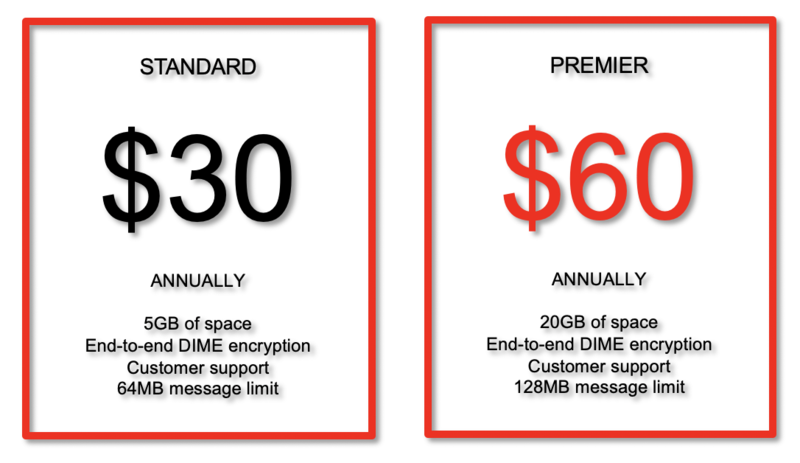 Developed by Lavabit, DIME is an open source secure end-to-end communications platform for asynchronous messaging across the internet. DIME follows in the footsteps of innovative email protocols, but takes advantage of the lessons learned during the 20-year history of PGP-based encrypted communication. DIME is the technological evolution of past current standards, OpenPGP and S/MIME, which are both difficult to deploy and are only narrowly adopted. Recent revelations regarding surveillance have pushed OpenPGP and S/MIME to the forefront, but these standards simply can’t address the current privacy crisis because they don’t provide automatic encryption or protect metadata. By encrypting all facets of an email transmission (body, metadata, and transport layer), DIME guarantees the security of users and the least amount of information leakage possible. A security-first design, DIME solves problems that plague legacy standards and combines the best of current technologies into a complete system that gives users the greatest protection possible without sacrificing functionality. To accommodate radically different user needs, DIME operates in three account modes: Trustful, Cautious, and Paranoid. Each mode represents a unique point in the security-functionality spectrum and determines how accounts operate. The difference between each mode is based on where message encryption (or decryption) occurs and where the user’s private key is stored. Federation was the thought from the beginning. We cannot be a secure email provider if users can only send to other Lavabit customers. We want to secure email, not keep it in a walled garden. Practically speaking, email as a service is not something that we can change dramatically to suit only one group. What works for privacy-aware consumers may drive away non-technical users, ease-of-use users, and businesses. Trustful. The server handles all privacy issues requiring users to trust the server. Accounts operating in Trustful mode send messages using the Simple Mail Transfer Protocol (SMTP) and receive messages using the Post Office Protocol (POP) or the Internet Mail Access Protocol (IMAP). Webmail systems handling server-side encryption functions operate in Trustful mode. While not as secure, this mode is designed for businesses. They have escrow key and document retention needs, and we had to address those. It is also for those users who want some security (encryption at rest, privacy from mail scanning), and don’t want to be bothered with keys. Cautious. The server is only used to store and synchronize encrypted data, including encrypted copies of a user’s private keys and encrypted copies of messages. Cautious mode provides a comparable user experience to email today, while minimizing the trust placed in the server. This is the first level of E2E. It allows the encrypted key to be stored on the server and makes it easy to switch from device to device. This is the level we foresee most mobile users choosing to use. Paranoid. The server will never have access to a user’s private keys (encrypted or decrypted). Paranoid mode minimizes the amount of trust a user is required to place in their server, but at the expense of functionality. Paranoid mode does not support webmail access or allow users access their account from multiple devices without an external method for synchronizing their key ring. This is level for those needing real E2E and security. The key is controlled by the user who can, if they wish, leave it on one device and destroy the key or device and ensure the messages are as irretrievable as possible. Trustful mode: How is it secure? We created Trustful mode for users who want a more secure email environment but require the ability to use existing email software. As the name suggests, Trustful mode requires users to trust the server to manage encryption. This mode ensures ease of use, as users do not need to worry about technical requirements or incompatibility with existing email clients. We envision Trustful mode as the mode of choice for businesses, which have regulatory requirements, data retention practices, and unique needs like escrow keys. 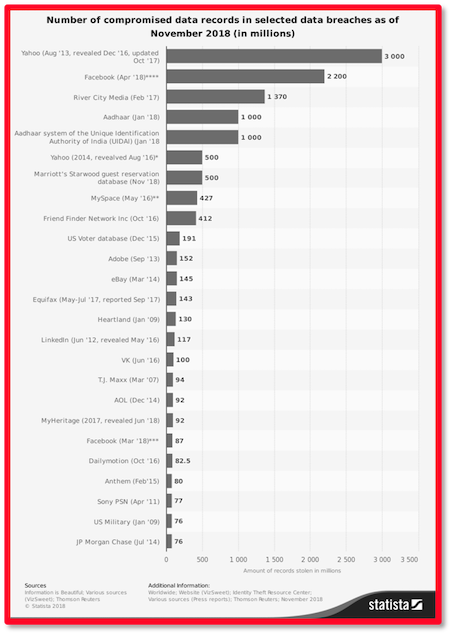 Lavabit’s free and open source server, Magma, supports these users. In Trustful mode, the user’s key is within our server's memory only while they are logged into the server. The server performs the encryption on the user’s behalf, and as such, they must trust that the server will not be rewritten in such a way that it captures their password or peeks at their messages during processing. This magic black box mode is no different from many other encryption systems, which perform encryption automatically. The only difference is where the encryption takes place. The key question is whether the customer is comfortable trusting the implementation to function securely. If they feel that trusting our servers to perform the encryption is unacceptable, we offer other modes of operation: Cautious and Paranoid. Cautious mode: How is it secure? Cautious mode is the first level of true end-to-end encryption. The user’s encryption key is only in plaintext within the memory of their device, be it phone, laptop, desktop, or mainframe. The key is encrypted on this device and then transmitted through a secure tunnel to our servers, where it is safely stored in space designated specifically for their account. If users have an account on one phone and decide to also install the client software onto a laptop, the cautious mode client can request the encrypted key from the server when the user logs into the system. Then on the laptop, using the user’s passphrase, the client will be able to decrypt the key and allow the client software on the laptop to access your messages. The key exists in a format that can be "seen" only on the devices controlled by the user. We anticipate most users will want the privacy and security of Cautious mode as it ensures they don’t have to trust the provider, but also doesn’t require them to alter the way they access their email. Users who believe they face a higher threat level and don't want a key to exist anywhere in any format except on devices where they maintain ABSOLUTE technical control may prefer Paranoid mode. Paranoid mode: How is it secure? Paranoid mode is our most advanced and ultimate security mode. In Paranoid mode, the key is never transmitted anywhere; users maintain ABSOLUTE control. It is up to the user to move their key to any new device. If they create the original key within client software and wish to also use it on their phone, they must devise a secure method to move the key. This will allow users to export it to a file while ensuring it’s secure and encrypted. They can use a data cable or their own trusted digital method to copy the key to the new device. They can use a device to communicate for a period and then destroy the key or device without storing a copy of the key. This renders all communication that the key opened inaccessible from that point on. Paranoid mode is ultra-secure; however, it requires technical proficiency in user key management. Ladar Levison: My name's Ladar Levison, I'm the CEO and founder of Lavabit. Richard Delgado: I'm Richard Delgado, and I'm the COO and co-founder of Lavabit. Ladar Levison: We're all about providing and advancing secure communications. Our focus is on building a federated encryption standard that will protect people's email. Richard Delgado: We've traded our privacy for convenience, and we're trying to take back that power. Ladar Levison: The biggest challenge was probably with the Department of Justice over the encryption key for the company because they wanted to get into Edward Snowden's email account. In turning it over, I would have compromised the privacy of active users, so instead I decided to suspend operation and rewrite the mail protocols. And that just present all sorts of technical challenges, to live in this interconnected world that we're in but still do it in a way where you retain control over who can read your messages. Ladar Levison: He already has a background in email and he loves cryptography. Jesse Draper: Well, welcome to Meet the Drapers. Give us your pitch. Ladar Levison: Thank you. My name's Ladar Levison, I'm the CEO and founder of Lavabit. This is my co-founder, Richard Delgado. He handles all the money and stuff. Our job is about building platforms that make encryption automatic and accessible to the average person. Last year, there were 74 trillion emails sent between approximately 3.7 billion people. Email is the most important written form of communication on this planet, and yet you get more privacy and more security by dropping a postcard in the mailbox down the street than you do by sending an email. Ladar Levison: Our job is to build a new generation of protocols, 'cause you have to remember, email was created before the World Wide Web. It was created all the way back in the 1970s, and those same protocols are with us today. Speaker 18: Online terminals are devices through which a person communicates directly with a computer, either to give it information or to ask for and receive the results of a transaction. Ladar Levison: Security is really an afterthought, so what we set about doing three years ago was reinventing those protocols, and I think we've done that. We've created a new generation of protocols that's more secure, more versatile, than anything on the market today. So we're out here seeking capital so that we can expand our development team and really build out our full implementation. Because we wanna go beyond email. We sort of see email as the heart of your digital identity. Tim Draper: How does the technology work? Typing in an email, I'm about to send an email, I send an email, goes. Where is your security piece and then where are all these other pieces that you're talking about? Ladar Levison: What we've done is we've integrated the ability for your software to look up the encryption key of the person that you're sending a message to, and tell you does this person support end to end encryption or not. But fundamentally, it looks up to see if the other domain supports encryption, and if it's a secure domain, your mail client will tell you. And if you're about to send out an unencrypted message, it'll tell you that, too. We like to think that if Hillary Clinton was using our software, there may not have been a scandal during the last election. Richard Delgado: So the law of the story is very well documented. 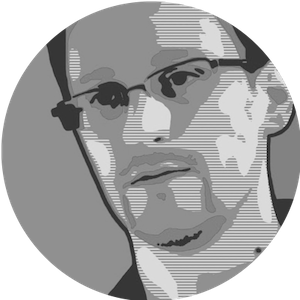 Speaker 19: Edward Snowden cared enough to use a service called Lavabit to protect his message. Speaker 20: And so the government came and said, "We want all the incoming and outgoing information from his account. 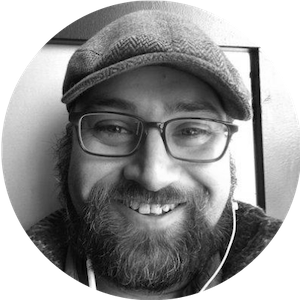 Speaker 21: Ladar, facing this circumstance, made the really tough decision to shut down his entire company to try to actually deliver a degree of security and privacy to his customers. Richard Delgado: We fundamentally believe that everyone deserves the innate right to privacy and freedom, and that's what we are, we're freedom fighters, essentially. All one has to do is look at the jaw-dropping headlines that [inaudible 00:19:17] to see exactly how dire these problems are, and what we trying to do is restore privacy back into modern communications [crosstalk 00:19:24]. Andy Tang: Isn't security and convenience a zero sum game? As far as consumers go? Ladar Levison: It's a difficult problem. Ladar Levison: There's this tradeoff. They say the more automatic you make something, the less secure it is. And that's why it took us three years, because we really had to develop things from the ground up. And I like to think that what we did is gave you the most amount of security you can get while keeping it automated. Q Motiwala: In case you sent me an email, if I had to forward your email to Tim or Andy, would they be able to see that email or no? Ladar Levison: Because you forwarded it, it would be wrapped in another layer of encryption, which would encapsulate the information necessary to decrypt the original message, as long as you were on a compatible system. Tim Draper: As a user, here's what I'm thinking. I'm thinking, great, it's gonna be secure and all that stuff, but I'm gonna keep getting these messages, "Would you like to send this on a non secure thing?" If I were in the CIA that would matter a lot more than just being in the venture business. Ladar Levison: You say that until you get hacked, and then you'll be coming to us in a hurry. Tim Draper: On the web. Right, we have been. Andy Tang: I'm surmising that, if we were on the Microsoft Exchange, maybe someone is on the Gmail, I'm surmising that that mail server needs to be Lavabit-compatible. Ladar Levison: Yes, at the most basic level. Ladar Levison: And we've already started that process, but we're also working on an exchange plug-in. There are ways of integrating these protocols into other platforms. And what we really hope is to develop our platform and use the security and encryption as a way to disrupt the existing players like Exchange, like the big cloud providers. Tim Draper: How do you make money? Richard Delgado: Well, we have subscription model right now. Tim Draper: Oh. You have customers? Richard Delgado: Yes, we have over 100,000 customers right now. Andy Tang: Why did you decide to restart the business after shutting it down? Ladar Levison: When we shut it down, we didn't walk away from the problem. We put on our thinking caps and tried to develop a solution that would solve this problem permanently for everybody. We spent two or three years developing and documenting this solution and now we're moving into the implementation phase. What we need to do now is build marketable products that the average person can use. Richard Delgado: It's our pleasure. Jesse Draper: Thanks, guys, so nice to meet you. Ladar Levison: It's a pleasure, thank you. Richard Delgado: One of the great takeaways that I have from this is they're interested in our platform technology. Tim is certainly invested in this space, so this is very top of mind. Ladar Levison: I developed a server based encryption program, which is what led to the whole Snowden litigation in 2013. 2004, I was 10 years ahead of the curve and when I started working on this in 2014, I was once again 10 years ahead of the curve. In other words, in another year's, 50% of the world's gonna be using our technology or something like it. Richard Delgado: We're certainly a startup but we have this very long and storied history that revolved around an important problem. Ladar Levison: We're poised to change the world. All we need is the resources to hire the development team to finish building out this platform and bring it to the masses. We like the idea of the fact that we're building a technology by the people for the people and we like the idea of Republic giving us an opportunity to raise the funds to do it from the people. Ladar Levison: What the crisis in 2013 taught me is that the way we think about security today doesn't work, and it sent me back to the drawing board to build this next generation. Jesse Draper: Well, so, what did we all think? Q, start us off. Q Motiwala: It's a really interesting idea. We think there are some challenges. They got to standardize their particular protocols and then make sure all the servers are taught that protocol. Because if you got only 20% of the people doing this, it's not gonna work. Andy Tang: I like how committed they were, because it sounds like they were on a mission to do this, it failed. And back when they were in the school days, they've been on this for a long time. Andy Tang: Yeah, and they kept going, so I thought that really got my attention, hey, these guys are committed so if you invest in them, you're not gonna lose your money because they won't give up. Jesse Draper: They'll make it happen. Jesse Draper: Where you look at it as commitment, I looked at it as like, "Well, this is the way we're gonna go," and so I don't know if that's good. As founders, as culture, I think they could be a little more open, but they also understand this space. And I do think that we need more secure email, but it's a big undertaking. Tim Draper: I did like their commitment to the mission, and I like that this is one of the big problems. Email is so important. I think giving it the 15-year test, is this thing gonna be alive in 15 years, or is it gonna be important in 15 years? I did get the viral part of this. This is gonna be very viral. Jesse Draper: What do you guys think? Do you wanna vote for them and do you like Lavabit? Go to meetthedrapers.com, because we are the only show on television where you can invest in the companies. Tim Draper: We wanna get the vibe up from the crystal ball. Jesse Draper: I feel like we have to say something, like a [bippedy boppedy boo 00:24:51], or something. Q Motiwala: Lavabit, chili beanie. Jesse Draper: Did you just say chili beanie? Q Motiwala: I got the energy, I got it. Jesse Draper: Did you get it? Tim Draper: Okay, I'm there. Jesse Draper: Okay, what do we think, guys? Thumbs up, thumbs down, thumbs all around. Q Motiwala: Oh [crosstalk 00:25:15]. Jesse Draper: I thought you were into it. Tim Draper: No, I'm into the market. I think identity wins here. Andy Tang: I think you were thinking in the 20 years. We're thinking in maybe five, 10 [crosstalk 00:25:24]. We face competition with respect to any products that we may seek to develop or commercialize in the future. Our competitors include major companies worldwide. Many of our competitors have significantly greater financial, technical and human resources than we have and superior expertise in research and development and marketing approved products and services and thus may be better equipped than us to develop and commercialize products and services. These competitors also compete with us in recruiting and retaining qualified personnel and acquiring technologies. Smaller or early stage companies may also prove to be significant competitors, particularly through collaborative arrangements with large and established companies. Accordingly, our competitors may commercialize products more rapidly or effectively than we are able to, which would adversely affect our competitive position, the likelihood that our products and services will achieve initial market acceptance and our ability to generate meaningful additional revenues from our products. We collect and store sensitive data, including intellectual property, our proprietary business information and that of our customers, suppliers and business partners, and personally identifiable information of our customers and employees, in our data centers and on our networks. The secure processing, and transmission of this information is critical to our operations and business strategy. Despite our security measures, our information technology and infrastructure may be vulnerable to attacks by hackers or breached due to employee error, malfeasance or other disruptions. Any such breach could compromise our networks and the information stored there could be accessed, publicly disclosed, lost or stolen. Any such access, disclosure or other loss of information could result in legal claims or proceedings, liability under laws that protect the privacy of personal information, disrupt our operations and the services we provide to customers, and damage our reputation, and cause a loss of confidence in our products and services, which could adversely affect our business/operating margins, revenues and competitive position. The secure processing, and transmission of this information is critical to our operations and business strategy, and we devote significant resources to protecting our information through the utilization of our encryption technologies. The expenses associated with protecting our information could reduce our operating margins. There are substantial risks and uncertainties associated with these efforts, particularly in instances where the markets are not fully developed. In developing and marketing new lines of business and/or new products and services, we may invest significant time and resources. Initial timetables for the introduction and development of new lines of business and/or new products or services may not be achieved and price and profitability targets may not prove feasible. We may not be successful in introducing new products and services in response to industry trends or developments in technology, or those new products may not achieve market acceptance. As a result, we could lose business, be forced to price services on less advantageous terms to retain or attract clients, or be subject to cost increases. As a result, our business, financial condition or results of operations may be adversely affected. We operate in virtually every part of the world and serve customers in more than 60 countries. In 2018, approximately 60% of our revenue was attributable to activities outside the U.S. Our operations are subject to the effects of global competition and geopolitical risks. They are also affected by local economic environments, including inflation, recession, currency volatility and actual or anticipated default on sovereign debt. Political changes, some of which may be disruptive, can interfere with our supply chain, our customers and all of our activities in a particular location. While some of these global economic and political risks can be hedged using derivatives or other financial instruments and some are insurable, such attempts to mitigate these risks are costly and not always successful, and our ability to engage in such mitigation may decrease or become even more costly as a result of more volatile market conditions. Such intellectual property rights, however, may not be sufficiently broad or otherwise may not provide us a significant competitive advantage. In addition, the steps that we have taken to maintain and protect our intellectual property may not prevent it from being challenged, invalidated, circumvented or designed-around, particularly in countries where intellectual property rights are not highly developed or protected. In some circumstances, enforcement may not be available to us because an infringer has a dominant intellectual property position or for other business reasons, or countries may require compulsory licensing of our intellectual property. Our failure to obtain or maintain intellectual property rights that convey competitive advantage, adequately protect our intellectual property or detect or prevent circumvention or unauthorized use of such property, could adversely impact our competitive position and results of operations. We also rely on nondisclosure and noncompetition agreements with employees, consultants and other parties to protect, in part, trade secrets and other proprietary rights. There can be no assurance that these agreements will adequately protect our trade secrets and other proprietary rights and will not be breached, that we will have adequate remedies for any breach, that others will not independently develop substantially equivalent proprietary information or that third parties will not otherwise gain access to our trade secrets or other proprietary rights. As we expand our business, protecting our intellectual property will become increasingly important. The protective steps we have taken may be inadequate to deter our competitors from using our proprietary information. In order to protect or enforce our intellectual property rights, we may be required to initiate litigation against third parties, such as infringement lawsuits. Also, these third parties may assert claims against us with or without provocation. These lawsuits could be expensive, take significant time and could divert managements attention from other business concerns. The law relating to the scope and validity of claims in the technology field in which we operate is still evolving and, consequently, intellectual property positions in our industry are generally uncertain. We cannot assure you that we will prevail in any of these potential suits or that the damages or other remedies awarded, if any, would be commercially valuable. Any dispute or litigation regarding patents or other intellectual property could be costly and time-consuming due to the complexity of our technology and the uncertainty of intellectual property litigation and could divert our management and key personnel from our business operations. A claim of intellectual property infringement could force us to enter into a costly or restrictive license agreement, which might not be available under acceptable terms or at all, could require us to redesign our products, which would be costly and time-consuming, and/or could subject us to an injunction against development and sale of certain of our products or services. We may have to pay substantial damages, including damages for past infringement if it is ultimately determined that our products infringe on a third partys proprietary rights. Even if these claims are without merit, defending a lawsuit takes significant time, may be expensive and may divert managements attention from other business concerns. Any public announcements related to litigation or interference proceedings initiated or threatened against us could cause our business to be harmed. Our intellectual property portfolio may not be useful in asserting a counterclaim, or negotiating a license, in response to a claim of intellectual property infringement. In certain of our businesses we rely on third party intellectual property licenses and we cannot ensure that these licenses will be available to us in the future on favorable terms or at all. 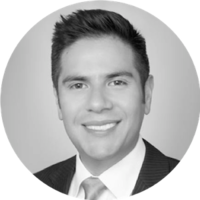 In particular, the Company is dependent on Ladar Levison (CEO) and Richard Delgado (COO & advisor). The Company has or intends to enter into an employment agreements with Ladar Levison and Richard Delgado although there can be no assurance that it will do so or that they will continue to be employed by the Company for a particular period of time. The loss of Ladar Levison, Richard Delgado or any member of the board of directors or executive officer could harm the Companys business, financial condition, cash flow and results of operations. The Company is dependent on Ladar Levison and Richard Delgado in order to conduct its operations and execute its business plan, however, the Company has not purchased any insurance policies with respect to those individuals in the event of their death or disability. Therefore, if any of Ladar Levison or Richard Delgado dies or becomes disabled, the Company will not receive any compensation to assist with such persons absence. The loss of such person could negatively affect the Company and its operations. We do not have the internal infrastructure necessary, and are not required, to complete an attestation about our financial controls that would be required under Section 404 of the Sarbanes-Oxley Act of 2002. There can be no assurance that there are no significant deficiencies or material weaknesses in the quality of our financial controls. We expect to incur additional expenses and diversion of managements time if and when it becomes necessary to perform the system and process evaluation, testing and remediation required in order to comply with the management certification and auditor attestation requirements. Various federal and state labor laws govern our relationship with our employees and affect operating costs. These laws include minimum wage requirements, overtime pay, healthcare reform and the implementation of the Patient Protection and Affordable Care Act, unemployment tax rates, workers compensation rates, citizenship requirements, union membership and sales taxes. A number of factors could adversely affect our operating results, including additional government-imposed increases in minimum wages, overtime pay, paid leaves of absence and mandated health benefits, mandated training for employees, increased tax reporting and tax payment, changing regulations from the National Labor Relations Board and increased employee litigation including claims relating to the Fair Labor Standards Act. Due to the nature of the discount rate of the Crowd Safe, when forecasting the hypothetical value of their holdings in different liquidity event scenarios, Investors should consider the overall valuation of the Company in addition to their individual return. In a liquidity event in which the value of an Investors stake is determined by the discount method (that being situations where applying the Valuation Cap results in a lower return for such Investor), the Investors individual return will be the same regardless of the Companys valuation. As an example, a $1,000-dollar investment in Crowd Safe units of a hypothetical company with a discount of 20% and a valuation cap of $10 million would result in a $250 return upon a liquidity event in which the company is valued at either $5 million or $10 million. However, Investors should consider that an ownership stake in a higher-valued company is generally preferable to an ownership stake with the same absolute value in a lower-valued company. The higher-valued company will have been assessed by the market to be worth more and will have additional funding with which to pursue its goals and is therefore more likely to produce greater returns to the Investor over the longer term. Technology companies, including many of the Companys competitors, frequently enter into litigation based on allegations of patent infringement or other violations of intellectual property rights. In addition, patent holding companies seek to monetize patents they have purchased or otherwise obtained. As the Company grows, the intellectual property rights claims against it will likely increase. The Company intends to vigorously defend infringement actions in court and before the U.S. International Trade Commission. The plaintiffs in these actions frequently seek injunctions and substantial damages. Regardless of the scope or validity of such patents or other intellectual property rights, or the merits of any claims by potential or actual litigants, the Company may have to engage in protracted litigation. If the Company is found to infringe one or more patents or other intellectual property rights, regardless of whether it can develop non-infringing technology, it may be required to pay substantial damages or royalties to a third-party, or it may be subject to a temporary or permanent injunction prohibiting the Company from marketing or selling certain products. In certain cases, the Company may consider the desirability of entering into licensing agreements, although no assurance can be given that such licenses can be obtained on acceptable terms or that litigation will not occur. These licenses may also significantly increase the Companys operating expenses. Regardless of the merit of particular claims, litigation may be expensive, time-consuming, disruptive to the Companys operations and distracting to management. In recognition of these considerations, the Company may enter into arrangements to settle litigation. If one or more legal matters were resolved against the Companys consolidated financial statements for that reporting period could be materially adversely affected. Further, such an outcome could result in significant compensatory, punitive or trebled monetary damages, disgorgement of revenue or profits, remedial corporate measures or injunctive relief against the Company that could adversely affect its financial condition and results of operations. Our agreements with advertisers, advertising agencies, customers and other third parties may include indemnification provisions under which we agree to indemnify them for losses suffered or incurred as a result of claims of intellectual property infringement, damages caused by us to property or persons, or other liabilities relating to or arising from our products, services or other contractual obligations. The term of these indemnity provisions generally survives termination or expiration of the applicable agreement. Large indemnity payments would harm our business, financial condition and results of operations. In addition, any type of intellectual property lawsuit, whether initiated by us or a third party, would likely be time consuming and expensive to resolve and would divert managements time and attention. To protect our rights in our services and technology, we rely on a combination of copyright and trademark laws, patents, trade secrets, confidentiality agreements with employees and third parties, and protective contractual provisions. We also rely on laws pertaining to trademarks and domain names to protect the value of our corporate brands and reputation. Despite our efforts to protect our proprietary rights, unauthorized parties may copy aspects of our services or technology, obtain and use information, marks, or technology that we regard as proprietary, or otherwise violate or infringe our intellectual property rights. In addition, it is possible that others could independently develop substantially equivalent intellectual property. If we do not effectively protect our intellectual property, or if others independently develop substantially equivalent intellectual property, our competitive position could be weakened. Effectively policing the unauthorized use of our services and technology is time-consuming and costly, and the steps taken by us may not prevent misappropriation of our technology or other proprietary assets. The efforts we have taken to protect our proprietary rights may not be sufficient or effective, and unauthorized parties may copy aspects of our services, use similar marks or domain names, or obtain and use information, marks, or technology that we regard as proprietary. We may have to litigate to enforce our intellectual property rights, to protect our trade secrets, or to determine the validity and scope of others proprietary rights, which are sometimes not clear or may change. Litigation can be time consuming and expensive, and the outcome can be difficult to predict. To succeed in our intensely competitive industry, we must continually improve, refresh and expand our product and service offerings to include newer features, functionality or solutions, and keep pace with price-to-performance gains in the industry. Shortened product life cycles due to customer demands and competitive pressures impact the pace at which we must introduce and implement new technology. This requires a high level of innovation by both our software developers and the suppliers of the third-party software components included in our systems. In addition, bringing new solutions to the market entails a costly and lengthy process, and requires us to accurately anticipate customer needs and technology trends. We must continue to respond to market demands, develop leading technologies and maintain leadership in analytic data solutions performance and scalability, or our business operations may be adversely affected. We must also anticipate and respond to customer demands regarding the compatibility of our current and prior offerings. These demands could hinder the pace of introducing and implementing new technology. Our future results may be affected if our products cannot effectively interface and perform well with software products of other companies and with our customers existing IT infrastructures, or if we are unsuccessful in our efforts to enter into agreements allowing integration of third-party technology with our database and software platforms. Our efforts to develop the interoperability of our products may require significant investments of capital and employee resources. In addition, many of our principal products are used with products offered by third parties and, in the future, some vendors of non-Company products may become less willing to provide us with access to their products, technical information and marketing and sales support. As a result of these and other factors, our ability to introduce new or improved solutions could be adversely impacted and our business would be negatively affected. Please see the section of this Form C entitled Transactions with Related Persons and Conflicts of Interest for further details. The Units of SAFE (Simple Agreement for Future Equity) will not be freely tradable until one year from the initial purchase date. Although the Units of SAFE (Simple Agreement for Future Equity) may be tradable under federal securities law, state securities regulations may apply and each Investor should consult with his or her attorney. You should be aware of the long-term nature of this investment. There is not now and likely will not be a public market for the Units of SAFE (Simple Agreement for Future Equity). Because the Units of SAFE (Simple Agreement for Future Equity) have not been registered under the Securities Act or under the securities laws of any state or non-United States jurisdiction, the Units of SAFE (Simple Agreement for Future Equity) have transfer restrictions and cannot be resold in the United States except pursuant to Rule 501 of Regulation CF. It is not currently contemplated that registration under the Securities Act or other securities laws will be effected. Limitations on the transfer of the Units of SAFE (Simple Agreement for Future Equity) may also adversely affect the price that you might be able to obtain for the Units of SAFE (Simple Agreement for Future Equity) in a private sale. Investors should be aware of the long-term nature of their investment in the Company. Each Investors in this Offering will be required to represent that it is purchasing the Securities for its own account, for investment purposes and not with a view to resale or distribution thereof. There is no assurance that an Investor will realize a return on its investment or that it will not lose its entire investment. For this reason, each Investor should read the Form C and all Exhibits carefully and should consult with its own attorney and business advisor prior to making any investment decision. Prior to the Offering the Companys current owners of 20% or more beneficially own up to 100.0% of the Company. Subject to any fiduciary duties owed to our other owners or investors under Texas law, these owners may be able to exercise significant influence over matters requiring owner approval, including the election of directors or managers and approval of significant Company transactions, and will have significant control over the Companys management and policies. Some of these persons may have interests that are different from yours. For example, these owners may support proposals and actions with which you may disagree. The concentration of ownership could delay or prevent a change in control of the Company or otherwise discourage a potential acquirer from attempting to obtain control of the Company, which in turn could reduce the price potential investors are willing to pay for the Company. In addition, these owners could use their voting influence to maintain the Companys existing management, delay or prevent changes in control of the Company, or support or reject other management and board proposals that are subject to owner approval. We have arbitrarily set the price of the Securities with reference to the general status of the securities market and other relevant factors. The Offering price for the Securities should not be considered an indication of the actual value of the Securities and is not based on our net worth or prior earnings. We cannot assure you that the Securities could be resold by you at the Offering price or at any other price. Investors will not have the right to vote upon matters of the Company even if and when their Securities are converted into CF Shadow Securities. Upon such conversion, CF Shadow Securities will have no voting rights and even in circumstances where a statutory right to vote is provided by state law, the CF Shadow Security holders are required to vote with the majority of the security holders in the new round of equity financing upon which the Securities were converted. For example, if the Securities are converted upon a round offering Series B Preferred Shares, the Series B-CF Shadow Security holders will be required to vote the same way as a majority of the Series B Preferred Shareholders vote. Thus, Investors will never be able to freely vote upon any director or other matters of the Company. In a dissolution or bankruptcy of the Company, Investors of Securities which have not been converted will be entitled to distributions as if they were common equity holders. This means that such Investors will be at the lowest level of priority and will only receive distributions once all creditors as well as holders of more senior securities, including any preferred equity holders, have been paid in full. If the Securities have been converted into CF Shadow Securities, the Investors will have the same rights and preferences (other than the ability to vote) as the holders of the Securities issued in the equity financing upon which the Securities were converted. The Company may never receive a future equity financing or elect to convert the Securities upon such future financing. In addition, the Company may never undergo a liquidity event such as a sale of the Company or an IPO. If neither the conversion of the Securities nor a liquidity event occurs, the Investors could be left holding the Securities in perpetuity. The Securities have numerous transfer restrictions and will likely be highly illiquid, with no secondary market on which to sell them. The Securities are not equity interests, have no ownership rights, have no rights to the Companys assets or profits and have no voting rights or ability to direct the Company or its actions. I share their vision and believe that their technology can solve very real problems. Encryption is making the future safer. An amazing startup changing the road of communications and protecting our digital futures! I believe Lavabit to be a company positioned uniquely aggressively to absorb protonmail and tutanota customer bases. Lavabit is able to capture the trust, an element that escapes Protonmail and Tutanota, and every other 'secure' email provider. Ladar has built the "BEST" in class platform and Lavabit's commitment to protect privacy of users and user data is UNPARALLELED. I think it is a good idea! Ray Blanco recommendation. I do believe cyber security is a big thing. I invested because I believe that secure/encrypted email will be a profitable business in the near future. I invested because I believe in the founder's mission with the technology, and want to help spread the word about its value to the end-users. I am fed up with the lack of privacy in the digital world which is overseen by by a bunch of liberal and politically correct thought police. I like what they are doing! it's a societally important goal to invest in. Trusting Lavabit to succeed in global privacy technology. Secure email communications will be an essential service in a privacy-deprived world. I believe individuals should still have privacy in a digital world. I believe in true privacy in this high cyber crime world we live in. Everyones privacy is essential in life!! I'm very concern about email security and believe hold heartly in the need!!! I am in the financial industry, I see anything dealing with cyber security being a boom. I invested because I believe that every sector needs the utmost security for the changing times, and for email, it's a definite no-brainer. It's true criminals get wiser as time goes by, but perhaps this technology can help level the field. I invested because I believe that Lavabit is a necessary product and will be ever more necessary for a secure future. I invested because my comcast xfinity email account was previously hacked and hijacked, where all my emails were set to be forwarded to some woman who I did not know. I thought it was a good investment. I invested because keeping email confidential between the sender and recipient/s is ideal and preferred. Also because I'm new to investing and I believe this will be a success. I believe in USA privacy act. Like the idea of protecting Privacy and building the Trust in the system. I believe in the founder's integrity and commitment to the Constitution of the United States of America. He is a hero! I support him. I invested in Lavabit because I believe in your vision!!!! Email vulnerabilities generally have been addressed through browser-based secure communications systems which sidestep the convenience of mail clients. We need a more convenient yet equally secure alternative. An investment in Lavabit is an investment in the future of privacy. I believe there is a need for easy to use security software. I get angry when I hear about people losing cryptocurrency and there is nothing they can do about it. Staunch advocate for privacy and security. Believe in the founders convictions. I believe in the cause. I invested in Lavabit because I believe in the need for true security and privacy for our most basic forms of digital communications. I have had my identity stolen in the last two years, and fortunately we reacted quick enough to limit our losses. Now, they seem that they are trying again. I remember using Lavabit as one of my first truly perfect encryption email services, and I think this is an area that will explode in the near future. Looking forward to being part of the journey! My mother works in the office side of the medical industry. Every day she scans up to 200 medical documents that arrive overnight via fax. DIME technology could be the end of such terrifying standard practice of publicly sending private documents! I admire Ladar Levison a great deal and his tireless fight to protect privacy ... this is my small way of supporting him and his company. I invested because I am very concerned about securing my e-mail. I truly believe Lavabit will be an startup unicorn very soon. Having secure end to end communication is critical in this digital era. I believe that privacy is a fundamental right that shouldn't be exploited for profit or diminished under the pretext of national security. Enterprises like Lavabit are essential to provide a counterbalance to big data and the surveillance state. I believe in Lavabit, and want them to succeed. I invested in Lavabit because I strongly believe in the mission, purpose, and ethos of the company. I believe that not only can privacy and security co-exist, but that privacy is the greatest tool we have to ensure security. Simple-to-use email privacy is of primary importance for all. Freedom to communicate in private. Not for illegal purposes but for my basic rights as a free human being. This is how it should be. I believe you represent my values and interests. The cheeky response to the NSL and order to produce encryption keys were excellent. Good on ya mate. Was using Lavabit before. Want a secure and privacy focused mail service. Secure mailing is a public requirement. I've been a Lavabit customer in the early days and the current development seems sound, from a technical standpoint – more reasonable than what Protonmail etc. do. Just to support Lavabit. I want to use it. Was an early Lavabit user. The fact that you shuttered operations rather than compromise our data is the reason I am investing today. Keep up the good work. I invested because I believe that lavabit's model is one that is truly likely to provide effective email privacy. This position is based on the lack of email systems offering realistic privacy models, and on the past ethical positions of Ladar L.
I was a Lavabit user pre-Snowden, and Ladar Levison's decision in 2014 to shut his company was beyond commendable. I trust him, and believe wholeheartedly in his vision for Lavabit/DIME. I am proud to invest in this company. A much required product, from a founder who is passionate about privacy abd security. I believe in this startup. I invested because I agree with the vision. I am in Health Care and had looked for options for secure data and found there to be too few choices. I also believe that the demand is going to grow exponentially in the coming years. Because email should be private. Invested $50 in Lavabit because I like what the Company is doing. I am investing for future of my grand sons. Security over the internet is becoming more of a problem and this sounds like a very good idea. Love their vision and dedication to secure email. The market demand for end to end email encryption will be much bigger that people anticipate. I believe that internet scurity will be required to keep the government out of one's business. Internet security and encryption services are absolutely essential. I invested because I believe in what Lavabit is doing to keep user privacy safe from hackers. I believe that email is broken by design and it needs to be fixed in a way that needs to be as convenient as possible for the user for widespread adaptation. I hope that Lavabit can be the ones to make it happen. Good luck! I invested because I believe that money grows in investment better. I believe in privacy and security. This market is huge and this will explode. digital security its the future. I have been hacked before so I believe in what lava bit is trying to do. I believe the right to privacy is fundamental to our society. Formidable and forward looking technology that is a necessity. Bringing together Privacy plus Security is what we need to protect our Investments! I invested in Lavabit because I believe in the efficacy of their business model and the positive impact they will have on the world as we move into the age of A.I. I believe the company will do great things in the future. Privacy and security are critical to individuality and free thought. I invested in Lavabit because I believe that everyone has the right to privacy and Ladar not only talks the talk - but walks the walk. Great leader and great product with growing traction - what more could you want. The best of luck to Lavabit! I invested because Lavabit has a track record of protecting its customers. And in this modern world, our digital rights need to be protected by trustable organizations against government abuse. I invested because I believe in privacy! I belive in you ! Privacy IS very important... don't take it for granted.